The area where I live is famous in Japan for its potatoes. We are used to having potatoes in our diet in a variety of forms, including a snack loved by children and tourists. 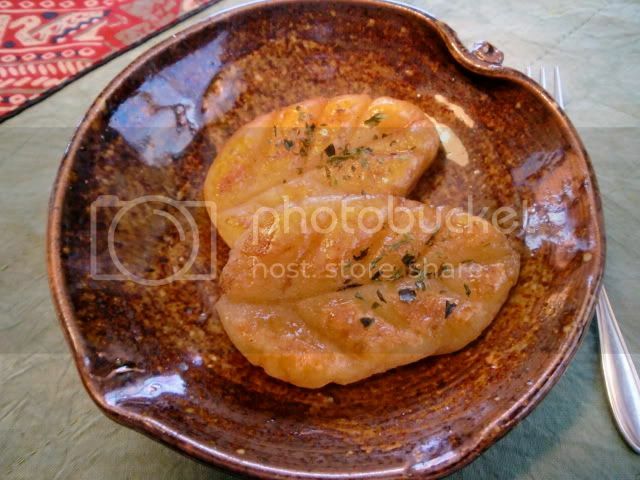 This is imo-mochi, a dumpling made only of potatoes and potato flour, and pan-fried in a bit of butter. The potato flour (you can substitute corn starch) gives the dumplings a glutinous texture like mochi rice cakes- hence the name. 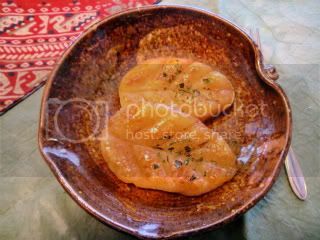 Ordinarily we shape the potato mixture into roughly circular patties, but given a fancier shape, this rustic snack becomes a pretty confection that is suitable for a tea party. It is not usually sweetened, but for this post, I've offered a sweet alternative. 1. 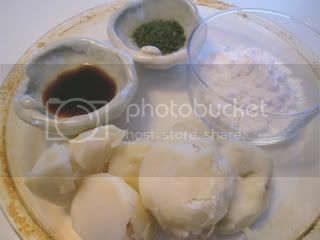 Mash the potatoes while they are still hot, add the katakuriko (or corn starch) and a pinch of salt. Combine ingredients thoroughly with a spatula. Depending on the potato or how it was cooked, it may need a tiny bit of water to make it malleable. If you decide to add water, start with one teaspoon or less. 2. When the mixture has cooled enough to handle, knead it with your hands till it is a smooth, elastic ball. 3. 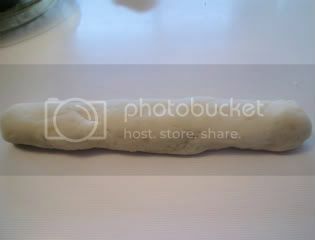 Roll the dough into a rope about 15~20 cm (6-8 inches) long, then cut it into 10 equal segments. 4. 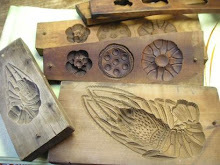 Place one of the segments on the palm of your hand and shape it into a leaf. 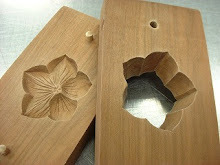 Using the dull side of a dinner knife, make vein-like impressions on the top of the leaf. Do this to all segments. 5. Heat a frying pan over medium fire and melt the butter in it. 6. Place the leaves in the frying pan (vein side down), and cover the pan. Cook till they begin to brown- about 2 minutes should be enough. 7. Turn the leaves over and cook for 1-2 minutes more. 8. Remove potato leaves to a plate and brush a little soy sauce over the surface of each. Then sprinkle a bit of seaweed flakes over them in an irregular pattern. 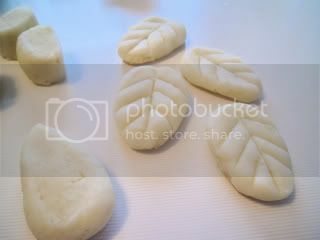 These little imo-mochi leaves will be crispy on the outside, soft and chewy like mochi on the inside. The dish and fork in the photo are very small, so the leaves are smaller than you might think-- no more than 3 inches long, and 2 inches at the widest part. They are best eaten hot. If you want a sweet version, add sugar to taste when preparing the potato dough in step #1, omit step #8 and instead, add soy sauce and sugar to the pan just before the potato leaves are cooked through. This will form a syrup with which you can coat the potato leaves, just as we did in the previous post on renkon yakimochi.